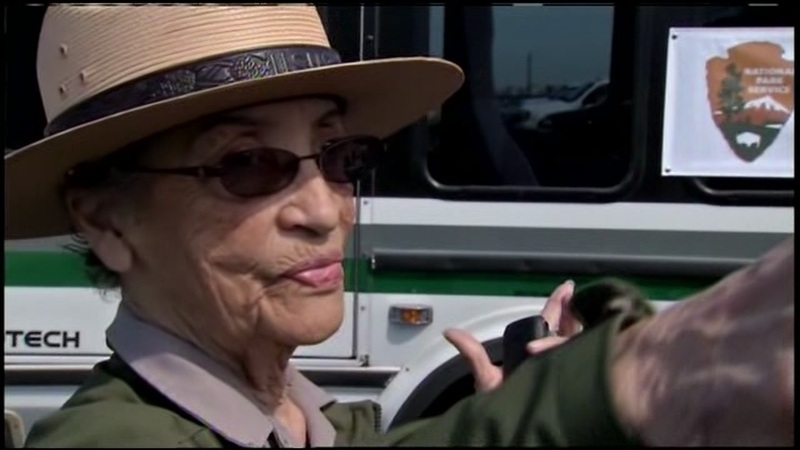 RICHMOND, Calif. (KGO) -- The country's oldest park ranger plans to return to work Tuesday in the East Bay following a violent robbery. Two weeks ago, someone broke into the Richmond home of Betty Reid Soskin, 94, and allegedly beat and robbed her. The intruder may not have known his victim, but President Barack Obama does. He gave Soskin a special coin to honor her as the nation's oldest park ranger. President Barack Obama gave 94-year-old Betty Reid Soskin this special coin to honor her status as the oldest park ranger in the United States. She vowed to remain in her house and continue working. Soskin is set to return to her job at the Rosie the Riveter historical park in Richmond. She told ABC7 News she doesn't want to be portrayed as a victim instead she wants to be viewed as a survivor. This undated image shows Betty Reid Soskin and her family in Walnut Creek, Calif.
Click here to make a donation to Soskin to replace the other items that were stolen from her.